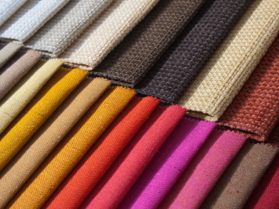 A range of flame retardant back coatings for upholstery fabrics to comply with BS 5852 Ignition Source 0, 1 & 5 (to comply with The Furniture and Furnishings (Fire)(Safety) Regulations 1988). Semi-clear flame retardant back coatings for upholstery fabrics to Comply with BS 5852 Ignition Source 0 & 1 (to comply with The Furniture and Furnishings (Fire)(Safety) Regulations 1988). Flame retardant back coatings to meet BS 7176 medium hazard. Flame retardant back coatings for wall coverings to meet BS 476 part 7. Flame retardant, rot proof water repellent impregnants for tenting fabrics. Hydrophobic water proof textile back coatings. Generally applied in combination with one or two other grades in order to achieve optimum water resistance. 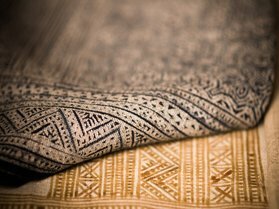 Anti-microbial textile back coatings. Anti-microbial systems can also be supplied in combination with many of the systems listed above. Water repellent, rot proof flame retardant shower coatings. Vertical and roller blind coatings to meet appropriate flame retardancy standards. Grades are available for application by knife, foam, rotary screen, and pad and gravure methods.